The Waters of the Cerrado Consortium unites coffee growers, producers, researchers and environmentalists in maintaining ecosystem services on which agricultural supply chains including coffee depend. Its focus is conservation and restoration of native vegetation in Brazil's Minas Gerais State to safeguard water supplies. The Cerrado, in the country's central highland plains, is a major source of water for Brazil. The consortium works with stakeholders across the coffee supply chain focusing initially on a pilot site – the Feio watershed in Patrocinio, a major coffee growing area. Efforts are under way to improve soil and water management; promote information and knowledge exchange through outreach services for farmers; and promote legal compliance on farms, including applying Brazil’s Forest Code at the landscape level. The Cerrado is home to successful agribusinesses but several environmental factors threaten the region’s long-term sustainability. Quality coffee is produced at scale and farms have a high level of certification. But coffee producers will face many challenges, the main one being dwindling water supplies. Vegetation loss and soil erosion threaten ecosystem services such as water regulation, pollination and climate regulation. Coffee producers realise the importance of ecosystems to productivity and are concerned about environmental impacts but have been acting on a farm level. After its start-up phase, the consortium needs funding to achieve an integrated approach to managing the landscape and agricultural practices. This would include the expansion of conservation and restoration work to at least six additional watersheds (covering 70% of coffee production) and mobilising producers in the region to implement the consortium’s vision. Coffee growers, coffee producers and local communities. The building blocks combine as a structure for piloting collective action which is a fundamental basis for the consortium’s expansion and replication. This structure helps to manage knowledge generated, harness lessons learned and understand patterns between the various actions. The platform faces a complex challenge given that this region includes 55 municipalities and thousands of different interests. The first building block addresses the need for a legitimate, articulate and relevant team of institutions strategically interested in the region, to define a common vision. The consortium was fortunate to be founded by robust international players such as IUCN and Nespresso. Partnership between a private sector actor that has an economic interest in the area’s conservation because of a supply chain risk and a leading international environmental organisation made the platform influential from the start. Concerted efforts were made to ensure the platform included voices that represented the whole region. For the platform to grow and achieve its full potential, it is important that it has a clear action plan and a governance structure robust enough for expansion. The consortium is boosting action from a farm to a landscape level. There are now shared goals and coordinated efforts – peer pressure is encouraging everyone to act. Information exchange and capacity building are strengthening ongoing actions to address water scarcity and natural resource depletion. There is a shift in attitude and behaviour among the community towards sustainability and a better understanding of common threats to ecosystem services as well as priority conservation values. The consortium has secured USD 190,000 to implement key activities in 2018 and 2019 with the Critical Ecosystem Partnership Fund (CEPF). The Patrocinio municipality in the Cerrado region is one of Brazil’s major coffee producing areas. Its main water source is the Feio watershed, a tributary of the Dourados River which flows into the Paranaiba River in turn, supplying 193 municipalities – a significant part of the Brazilian population. Between 1970 and 1980, the Feio watershed suffered intense change through cattle farming and cereal and coffee production. But over time coffee farms have become more professional and have improved their land management to ensure better conditions for future generations. Farmers have adopted appropriate soil management techniques, restored degraded areas, helped conserve protected areas, and protected the area’s water sources. However, further action is still needed as water shortages in the region have become more frequent in recent years. Increasing awareness, encouraging good practices and concerted restoration efforts can help safeguard the watershed. 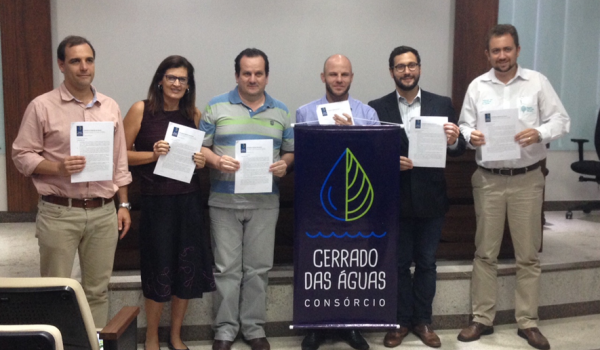 The Waters of the Cerrado Consortium selected the Feio watershed to host its first pilot project with a view to scaling up the model across other watersheds. This innovative engagement has proved to be a viable option for building a new model focussed on long-term solutions in the Cerrado region and has the potential to inspire other players who are ready to step up to make a difference.